How Patent Counsels can use patent landscapes to help make better R&D Decisions? Digital Equipment Corporation, once a leader in the computer market for decades does not exist today. Why? Because they failed to grasp the trends. Instead of continuing in the direction of progressive innovation, the then president of DEC, Mr. Ken Olsen, was skeptical of the success of desktop computers market and went as far to say – “There is no reason for any individual to have a computer in his home”, during a talk. We all know what followed. Don’t we? DEC is only an example and there are many others. Eastman Kodak, Border books, Blockbuster, the list goes on. One common denominator for their failure is that they did not align their businesses with technological progress. It might make one ponder – How could it have been avoided? This might sound unconventional, but patent counsels(IP Counsel; term used interchangeably) could have helped avoid the failure of these businesses along with many others. A lot of you might wonder – How can patent counsels help organizations from failing? Isn’t their job limited to the prosecution, maintenance, and monetization of the patent portfolio? A Patent counsel has multiple responsibilities in their job profile, and while prosecution, maintenance, and monetization form a significant part, an important yet most overlooked of their KPIs is to help formulate the innovation strategy of the organization. Patent Counsels have the potential of running the innovation wheel of his organization at full speed. This very KPI could help organizations from failing. Let me explain how. How Patent Counsels Can help set the direction of Innovation for an Organization? With changing times where every innovation needs to be protected to have a significant hold over a market, it has become paramount to have a patent strategy that is in sync with the business strategy of an organization. But more often, organizations (Read patent counsel) consider patents merely as an offensive or defensive tool and fail to leverage the futuristic insights, which can set them ahead of the competition. Patents, as we know them, are an index to the future. 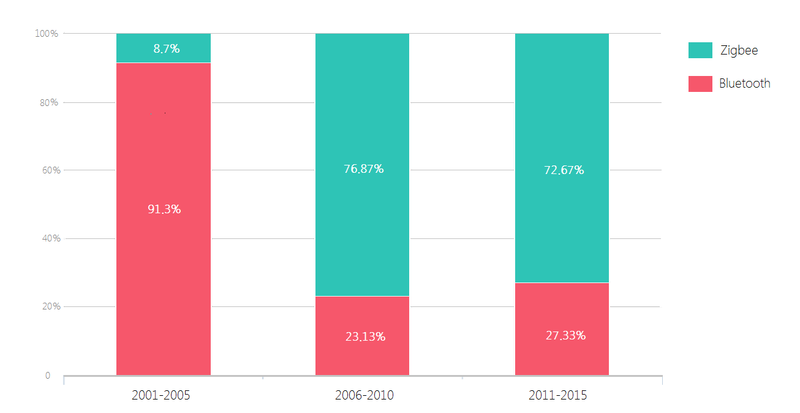 Analysis of patent filing data can tell a lot about technological trends. By identifying white spaces or innovative areas that resonate with the business areas of an organization, IP counsels can help frame innovation strategy such that an organization indulges in progressive innovation while continuing to expand their portfolio in the domain they already operate in. Patent filing data could be leveraged to find what would be the next big thing, the technologies that would rule the future and even give a glimpse of technologies that would cease in the near future. These insights, if acted upon, can give an organization formulate a proper R&D strategy, which could help R&D teams decide where next to invest their resources which can gain a high ROI for the organization. How Patent Counsels Can Use Patent Data to Decide Where R&D Investment Should be Made? Let us take an example to drive the point home. Consider the below chart comparing two communication protocol technologies in embedded systems and its growth in the past 15 years. Back in 2001, Bluetooth was the de-facto standard and Zigbee was a small player. But tables turned in the next 5 years and Zigbee’s growth outranked Bluetooth. We know today’s situation where Zigbee leads the market of communication protocols for smart homes. Companies that acted on this insight and innovated pretty early reaped the fruit. One such company was Chipcon, a mixed signal and wireless chip company, which introduced CC2430, the very first Zigbee System on a chip solution, which went on to become highly successful. Chipcon was acquired by Texas Instruments five months within the launch of CC2430 for a whopping 200M. As a result of the acquisition, Texas Instruments is regarded as one of the top vendors in the home automation market. Acting on the insights from patent filing data can prove to be highly beneficial for an organization, helping it to reach its zenith. 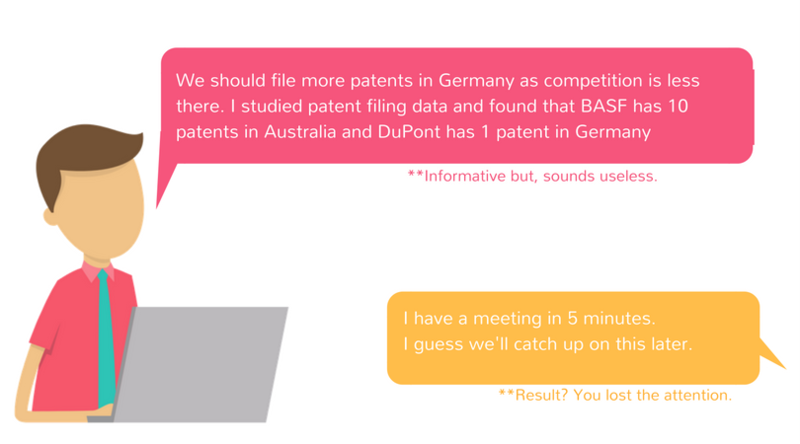 How Patent Counsels Can Communicate these Insights to Business Teams? In a perfect world, IP counsels can communicate these insights to business teams which would give them precious clues about the technological trends, and business teams would take actions accordingly that would decide the direction in which R&D would take place, enabling progressive innovation. But, we don’t live in a perfect world. It is often the case that the business teams are so engrossed in their R&D efforts that they don’t pay much heed to whatever IP counsels have to say. The claims of IP counsel often go unheard and results in a loss for the organization in the future. How to make them listen to you? The dominant question is – What can IP Counsel do so that the business teams do not just listen to their comments, but also take business decisions accordingly? The solution to the problem is not very complex. It is often found that the insights submitted by the legal teams have a lot of legal jargon, which makes it difficult for business teams to leverage the data. When it comes to conveying an idea, it is always better to support them with facts in an easy-to-understand format. For instance, consider that you work for a Multi-national organization that manufactures solar cells. You do a study of market filing data of top competitors in the domain and analyze the number of patents they have in each country. An analysis would reveal that Germany has the least number of patents filed by any of the competitors. You realize that getting patents in Germany would prove to be of great value. Now, all you have to do is to communicate it to the business team so that you everything is agreed upon to get started. How would you present this to the business team? Well, you lost the attention of the business team when G filed H patents in I land! Or you can do it this way! 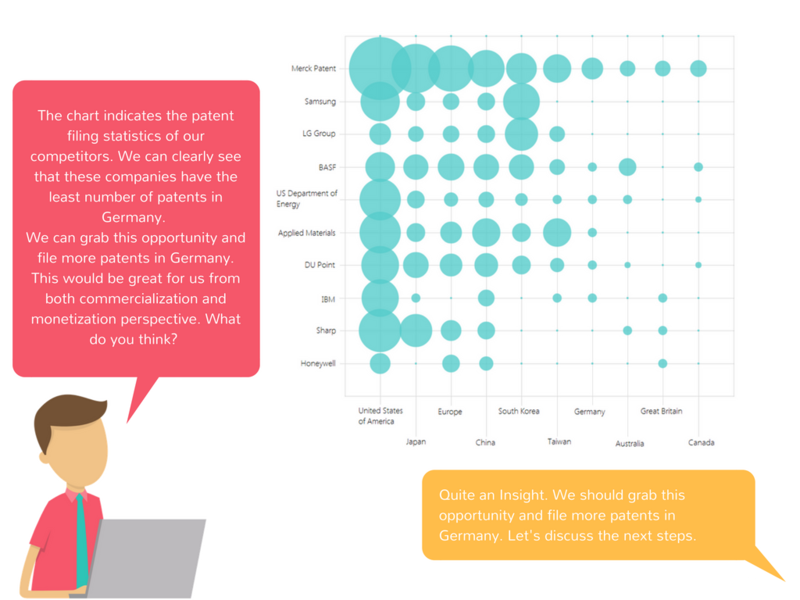 When it comes to presenting insights, facts presented with visual cues are much more effective. The key is effective communication combined with solid insights presented in a visually appealing and easy-to-understand format. Consider for the instance that your company operates in Video games domain. A look at the communication devices patent filing data reveals that in the last few years, there has been an increase in numbers of patents filed in the head-mounted display domain. Now, you can suggest the business teams to invest in developing games that are HMD-compatible in a similar manner. This won’t just warm you up for the race in the future but also help in claiming a niche spot among the top players. If the legal and business teams of an organization collaborate, nothing can stop them from succeeding. Success lies in unity, after all. Dear IP Counsel, Go ahead and identify those unexplored areas that will help your organization grow. What your competitors are working on behind the curtains? Which new products may hit the market in next 1 to 2 years? What are the key issues most of the players of your industry are trying to solve? Where you should channelize your efforts?